For last Saturday, it was cloudy but no rain for the whole day. Trail was wet tho. So if there's no rain tomorrow morning, I'll head to the trail. hey ang, let me know if you're heading up next saturday. I have a friend who may head up with me next week. Unfortunately it looks like we'll still have lousy weather this weekend according to the HKG observatory. I enter thru the correctional institute entrance along Shek O Road. There's a paved entrance around the curb and several metres along this is a barrier that you go through to go to the trail. Do you enter the "catch water" near Chai Wan Road / Tai Tam Road and then show up near the Shek O Road? I go by Cape Collison Road, thru the grave yards and reach the entrance of the MTB trail. If no rain this weekend, I'll go for a quick run early in the morning. Are you ok this weekend? let me join you fellas next time. I was up there couple weeks ago with utter disappointment due to the fog. I'm a total beginner so I was going super slow up and down the trail. I cut through the aquaduct to reach the correct centre so it saved me lotta time from going up Tai Tam Road. No problem. However I'm in Kuala Lumpur the next few weeks. Will let you know when I'm back. I'm also not that technical a rider. 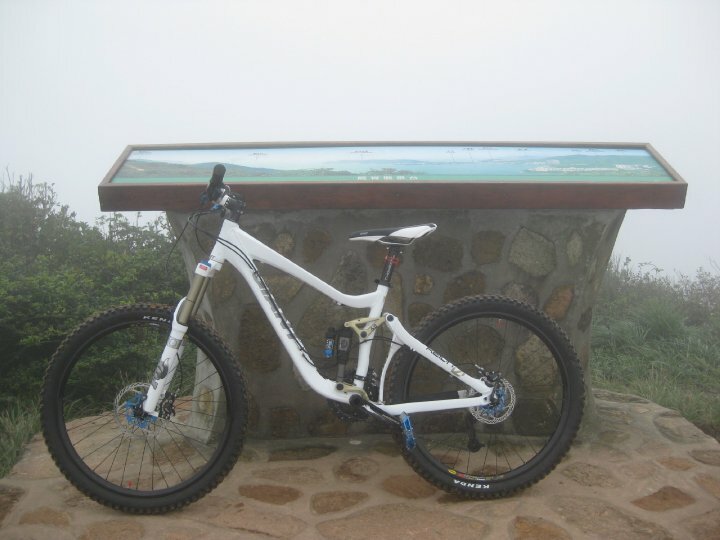 I'm a beginner and I often ride Dragon's Back (contour trail) during weekends (morning). I was also thinking of riding yesterday but thought that there would be a lot of hikers. I guess with the weather the way it was, people decided not to hike. I'm sure you still enjoyed in spite of the heat and humidity. Hope to bump into you guys one of these weekends. We tried the contour trail last Sunday morning and were surprised that there were only a few hikers. However it was hot and humid tho. I tried this trail today and did it clockwise. Unfortunately the weather did not cooperate as it was foggy all morning long. You can imagine the disappointment I had when I got to Shek O Peak and I had no views to enjoy. Total time was a little over two hours which included a lot of stops to take photos in spite of the fog. 1. There are a lot of sections where you have to carry your bike, up and down steps (a whole lot of them), through rocks and slippery soil, etc. I don't recommend this trail for beginners and for people who have heavy bikes who might not have the strength to carry their bikes a long way. 2. Wear shoes that have traction. There are portions where you have to go through rocks and cut out granite slabs while carrying your bike. 3. Do not underestimate the trail. There are quite a number of downhill sections that have pretty large rocks, drops and obstacles. Unless you're Steve Peat, I don't recommend you to try them out without first knowing the trail or having the technical skills and appropriate bike. 4. Along the main trail, there are corners where it's pretty narrow with rocks and roots that you need to be wary of. Again knowledge of the trail is important. 5. If you want to see the beauty of the surrounding area of Shek O, I suggest you check the weather report first. From the pictures I've seen on a clear day they are magnificent and spell binding. I'll definitely be back but on a sunny day. 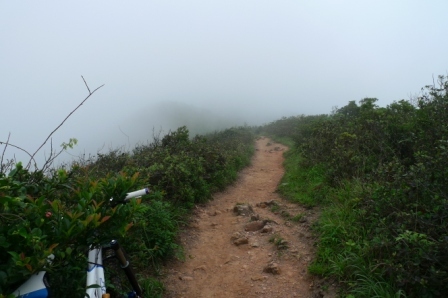 There were hardly any people on the trail and I didn't see any bikers (maybe because it was a weekday and foggy). Now that I know the trail a little better, I should be able to enjoy it more.